NYLisPendens.com is a product of American Foreclosures, Inc. Launched in 1999, NYLisPendens.com answered a growing need for real estate professionals, investors and home buyers to find current, reliable and affordable leads with the click of a mouse. American Foreclosures was founded in 1992 as a monthly listing service; a resource for home buyers and real estate investors, providing pre-foreclosure and bank foreclosure listings of distressed properties in New York & New Jersey. The monthly magazine American Foreclosures & Auctions developed from that in 1993 and included bank & government foreclosure listings in the states of Connecticut, Florida & Pennsylvania. It quickly became the source of exceptional values in the New York and New Jersey area. Banks and government agencies with REOs to sell came to rely upon American Foreclosures & Auctions as a responsible means of directly disseminating information in regards to pre-foreclosure and foreclosure listings to interested parties. Since our readers were also interested in other types of "good deals," we began including auction information about cars, boats, jewelry, art and other merchandise. Expanding coverage of more counties, more states and more banks helped the magazine progress to its current status. Along with the increased editorial content came growth in circulation and distribution. American Foreclosures & Auctions can now be purchased in over 4,000 locations throughout New York and New Jersey including Barnes & Noble Bookstores, Borders Books & Music, Quick Chek shops, many 7-11 convenience stores, newsstands and other locations. It wasn't long before our readers demanded more! And more good deals were on the way. We introduced the Business Opportunities section and later, our popular Handyman Specials section, complete with photos. Currently, each month we include informative, instructional articles about buying, fixing & selling properties including distressed properties. Many articles are contributed by experts in the fields of financing, renovation, and legal issues. Known as the "Bible of the Industry," American Foreclosures & Auctions magazine was once described as "Legal Insider Information" by Allan Dalton, Vice President of the former Murphy Realty/Better Homes & Gardens. Craig Laube, the publisher of American Foreclosures & Auctions became a weekly guest on the popular radio show "Foreclosure Forum" which aired on WEVD 1050 AM in New York. The host, Joyce Aponte, is a well known and respected real estate broker who specializes in selling foreclosure properties in New Jersey. Craig and Joyce were asked to appear at numerous home buyer fairs and financial expos throughout the tri-state area. 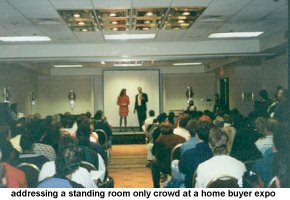 Their one hour "How To" seminar became so popular at these events that they eventually scheduled full day seminars to accommodate the demand. 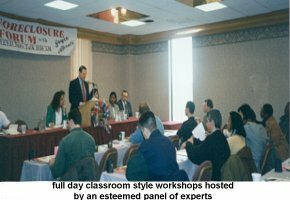 These thorough, classroom style workshops were hosted by a distinguished panel of experts including representatives from the Veteran's Association (VA), Housing and Urban Development (HUD), as well as financial experts, lawyers, home inspectors, credit specialists and Realtors. Unable to meet the demand for these workshops, Craig and Joyce collaborated on the all inclusive: "How To Buy & Sell Foreclosures" guide. This instructional book which illustrates everything you'll want to know about buying, fixing and selling foreclosure properties, is available now at major bookstores or you can purchase a copy here for $29.00. In addition to www.nylispendens.com, we publish www.njlispendens.com (pre-foreclosures in New Jersey), www.phillylispendens.com (pre-foreclosures in Philadelphia, PA) and www.americanforeclosures.com, (bank and government REO's nationwide). Another program, currently expanding, is the American Foreclosures Network. We will be working in cooperation with realtors nationwide to serve our customers even better. Look for updates on this site as the network grows!